My Little Pony Friendship Carnival is ready to gallop its first show in Hong Kong! Meet Twilight Sparkle, Pinkie Pie, Applejack, Fluttershy, Rainbow Dash and Rarity at the AIA Vitality Park on Central Harbourfront from April 19–May 5 to celebrate the magic of friendship with lots of laughter and adventures! Additional Ticket per Adult $50, Additional Ticket per Child $120. Additional ticket must be purchased and used with the Combo Ticket. 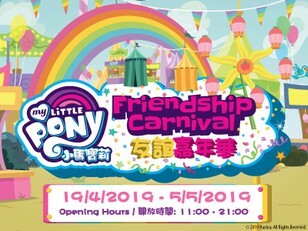 My Little Pony, the iconic, internationally-beloved franchise brand, will teach Hong Kong all about the magic of friendship when the My Little Pony Friendship Carnival gallops into town for its first show in April. 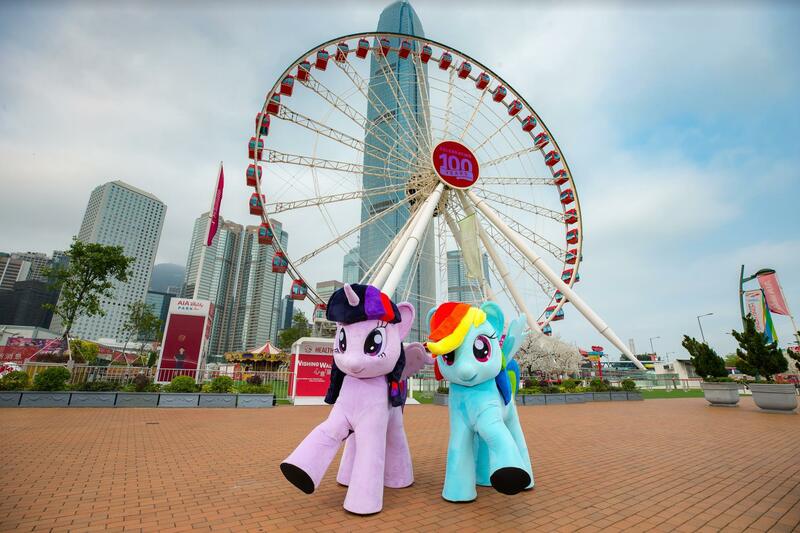 From 19 April to 5 May, pony fans can follow Twilight Sparkle and her Ponyville friends: Pinkie Pie, Fluttershy, Applejack, Rainbow Dash and Rarity, on their friendship journey filled with wonder, laughter and excitement - the first ever experience of its kind at Hong Kong Observation Wheel & AIA Vitality Park! The Library with Twilight Sparkle, who is very knowledgeable, curious and loves to read. Pick your favourite book from the bookshelf and to listen to the ponies’ adventures through story telling sessions. The Forest is where you’ll find Fluttershy, who adores all the cute little creatures that make their home in the woods. Help the ponies find their pets and don’t get trapped in the maze! The Farm is where Apple Jack lives. She loves apples and taking care of her farm! Can you help Apple Jack find her missing apples in the sand pit? The Party features party queen Pinkie Pie. However, you can only join her party by helping the party queen prepare cookies and candy! The Gym is the athletic Rainbow Dash’s favourite spot because she loves to gallop quickly! Join her in the stationary bikes challenge, where pony fans can ride with their parents and charge up the Pony Rainbow. The Dressing Room is filled with colourful mirrors and wardrobes, and that’s where you’ll find Rarity! Here, you can listen to advice from professional makeup artists and take a picture of yourself dressed like your favourite pony! Not only can you experience this friendship journey at the carnival, you can also greet the six characters during the mascot meet and greet sessions and watch them comes to live on stage! You’ll also be enjoying a touch of pony magic and sparkle with face painting and painting your own pony with cutie marks and other accessories. Don’t miss the Easter special offers only available on Facebook(@mlpfriendshipcarnival) during the carnival! Brought to Hong Kong by My Little Pony in partnership with Family Entertainment Ltd, Sun Entertainment Asia Limited, Joy Luck Entertainment Limited, About Now Entertainment Limited and SBB Capital Limited. - Free admission is granted to children under 18months. - Additional Ticket per Adult $50, Additional Ticket per Child $120. Additional ticket must be purchased and used with the Combo Ticket. - Blackout Days: 5th May 11AM - 1PM, the event opens to the public at 1PM on this date.